Nikon has just announced its new D5200, which employs a 24Mp APS-C chip and inheerits a lot of features from the Nikon D7000 rather than the comparatively amateurish D5100 that it replaces. Unfortunately, as of this writing, pricing is TBA on the D5200. 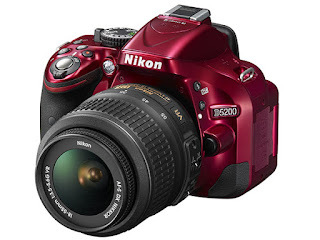 However, with the new D3200 selling for $600 and the old D7000 going for around $1100, I'd bewilling to bet that the D5200 will go fotr about $900, which begs a question: should I get a D5200 and skip the D7000? designed to trick people into buying a camera based on a feature that they will never use. Another problem here, small pixels, which smart people are not all that crazy about to begin with. It doesn't take a college degree to figure out that, if two camera sensors are the same size but with different pixel counts, the one with more pixels must also have smaller pixels, too. Technically speaking, this is known as pixel density. The problem: all sensors have background noise and small pixels capture less signal than big ones and are thus less capable of drowning out the noise. Result: cameras with small pixels produce noisier images than cameras with large pixels. Go here for a detailed explanation of pixel density and here for photographic tests that prove the same point. Simply put: if it is 24Mp, the D5200 probably won't be able to touch (let alone better) the high ISO performance of Nikon's current, 16Mp D7000. Bottom line: all's equal here. Another headline feature of the D5200: a 39-point AF system. While this is a huge upgrade from the D5100, this is exactly the same AF system that is on the D7000. Once again: both are equal. As for what the D5200 can do that the D7000 can't, here we go. First of all, the D5200 has wi-fi capability. So what? Wi-fi has absolutely nothing to to with making pictures. Instead, it serves as a great conversation piece for technophiles who now have the ability to say "look what my camera can do" to their Facebook "friends" (who they can now share pictures with in high-resolution an instant after snapping them thanks to this wonderful technological innovation) because they are too absorbed in virtual reality to develop meaningful friendships with people in real life. Great, another reason for Nikon to charge us more money for a camera. Another feature Nikon is raving about: GPS, how stupid, why on Earth does a real photographer need to have their exact global positioning in their EXIF data? Another great innovation: an articulating LCD screen, woo-hoo! Yes, the D7000 doesn't have 24Mp, wi-fi, GPS, or a flapping LCD screen, but it can do a lot of things that the D5200 almost certainly won't be able to do when, in contrast, the D5200 only clearly beats the D7000 on the non-photographic front. Personally, I'd buy the D7000 just for its ability to use the old, cheaper, virtually indestructible mechanical drive Nikkor lenses and for all of those direct access control buttons. Heck, if you want a lot of camera but can't afford anything over $1000, you'd be better off snagging a used D200 (or even D300 by now if you're lucky), provided you're a photographer and not a techno geek. definitely the d5200 will kill d7000 as to picture quality, and its beautiful interface. Reviews often throw in generalisations - such as here that pixel density means worse noise - without actually comparing cameras or checking review sites where you can see head to head ISO comparisons.